On the eve of the second round of the presidential elections in Ukraine, both candidates drove off abroad. Poroshenko – to meet with German and French leaders Merkel and Macron. Zelensky – only with Macron, but before Poroshenko. Experts are sure that the news about this meeting hurt the president and forced him to go to extreme measures, including an unexpected visit on a live TV channel “1 + 1”, where he was not invited, and a skirmish with candidate Zelensky. Zelensky flew to meet Macron in economy class of the Kiev – Paris plane. 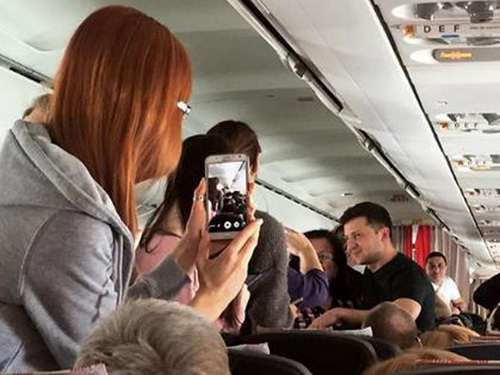 Immediately after take-off, there was a queue of people willing to take a selfie with him. According to polls, in the second round, Vladimir Zelensky almost doubled his opponent. Candidate of Political Sciences Alexei Yakubin is confident that this pushes the country’s leader to desperate measures. The headquarters of the president publishes a video on which his opponent is hit by a wagon, Zelensky is thrown with mud and accused of drug addiction. Poroshenko’s actions become chaotic: he first hangs up campaign posters depicting himself and Putin, and then glues the poster with a picture where there is no Russian ruler. But Poroshenko decided to go further and, taking advantage of his status, broke into the studio of the TV channel “1 + 1”, where they were preparing a live program, and demanded Vladimir Zelensky to the debate urgently. At the same time, he knew for sure that the candidate was already in Paris. However, Zelensky still appeared in the studio – via video link. He recalled that he was in France and the president knows this. He also recalled that they have already decided on the date of the event, and it is April 19th. After that, presidential candidates began to interrupt each other. As a result, Zelensky said goodbye and hung up. According to the Kiev political analyst Cyril Molchanov, Zelensky behaved unrestrainedly and therefore now it’s not worth waiting for a debate. “It is obvious that Poroshenko is an experienced speaker and will be able to put his opponent in a disagreeable form, provoking a breakdown. I think that the debate will not be. Moreover, after yesterday’s spontaneous call, they can harm the image of Zelensky, ”the expert believes. A skirmish of candidates attracted the attention of the leader of the Ukrainian Batkivshchyna party, Yulia Tymoshenko. In this story, she saw the humiliation of the state and offered the candidates “to remain people” and “not to become participants in someone else’s show.” In turn, the leadership of the channel “1 + 1” plans to sue Poroshenko for the fact that he “broke into the air without an invitation,” and for past accusations against the channel. Alexander Tkachenko, general director of the 1 + 1 Media group, noted that the head of state refused to leave the studio even after polite hints leading to a chair in the studio. – On Friday, Zelensky meets with Macron, and this in itself is a kind of signal that the West understands: Poroshenko will not win the election. This news was a blow to Poroshenko, because it speaks of the destruction of the monopoly on external contacts, on which the president was actively building his election campaign. When Western politicians are ready to meet not only with Poroshenko, but also with Zelensky – this puts the latter on one side of the scale with the current president. This suggests that at least in France are aware of reality and are not ready to pull Poroshenko, like a suitcase without a handle. I think that because of this, the president played this comedy in the studio of the TV channel, saying that he was ready to debate with Zelensky. The sole purpose of this story is to attempt once again to manipulate the public consciousness. The president rushes in different directions to find something that will allow him to drastically turn the tide in his favor. Regarding the conversation of candidates in the air Poroshenko’s supporters say that Zelensky was rude. You know, I specifically watched this video several times, but did not notice anything like this, it behaved quite correctly. In any case, Poroshenko can now do anything. He can meet with Merkel, can wear a new suit, act in any image – people are tired of him.